Aquaman sounds like it will truly be something special. And it's coming from a man who has already redefined the horror genre for a new generation. One of the new movies hitting theaters this weekend is director James Wan's The Conjuring 2, which will be going up against Now You See Me 2 and Warcraft. While doing press for the movie, James Wan has also been teasing new details about his highly-anticipated Aquaman movie, which stars Jason Momoa as the title character and Amber Heard as Mera. While we don't know exactly when production will begin, it seems the movie will have a number of "super cool" villains, according to the director. Back in November, a rumor surfaced that claimed the DC Comics character Black Manta will serve as the villain, with another report claiming the movie will be much darker than this spring's Batman v Superman: Dawn of Justice. Still, we haven't heard much else about the story or the other characters we'll see in Aquaman, but during an interview with CinemaBlend, director James Wan teased that the villains will be "larger than life." Here's what he had to say below. "I gotta say, one thing I love about the Aquaman world is all the really different, really interesting characters. They are interesting characters, including the villains - I'm not going to tell you which villains I'm going to play with! [laughs] But they're super cool. They're very larger than life, but they're unique." It's also worth noting that, just last month, rumors surfaced that James Wan would be exiting the Aquaman movie, although he shot those reports down with a photo that he posted on Twitter. 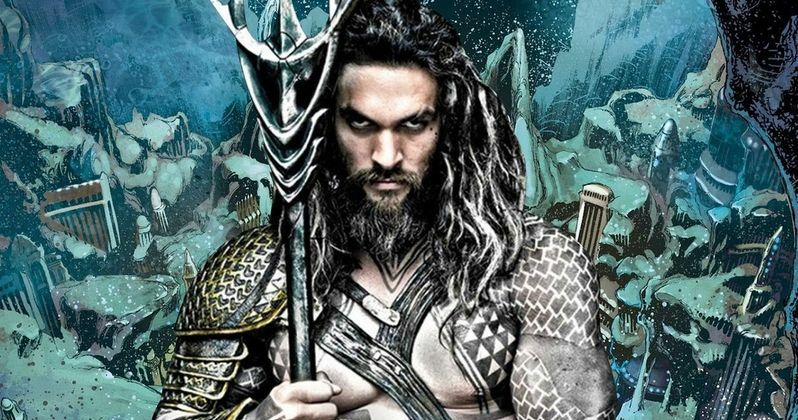 We got our first look at Aquaman during his cameo appearance in Batman v Superman: Dawn of Justice, and there have been previous rumors that the movie will feature plenty of other sea monsters and creatures as well. Here's what the director had to say about how unique the Aquaman world truly is. "That's what I'll speak to - the uniqueness of the Aquaman world. There are so many superhero movies now; I don't want to make a superhero movie now for the sake of doing it, but there's something unique to the world of Aquaman. There's a reason why they've never made a movie about this until now, because technology has never allowed us to tackle something this complicated. And so because of that it feels like something different, and that uniqueness is what I'm excited about." Warner Bros. has already set a July 27, 2018 release date for Aquaman, with Jason Momoa currently filming Justice League Part 1 in the U.K., which is set for release on November 17, 2017. Both Aquaman and The Flash (March 16, 2018) will hit theaters between Justice League Part 1 and Justice League Part 2, which is scheduled for release on June 14, 2019. Stay tuned for more on Aquaman as we get closer to production starting on this superhero adventure.